Correct earmolds for severe-profound loss? 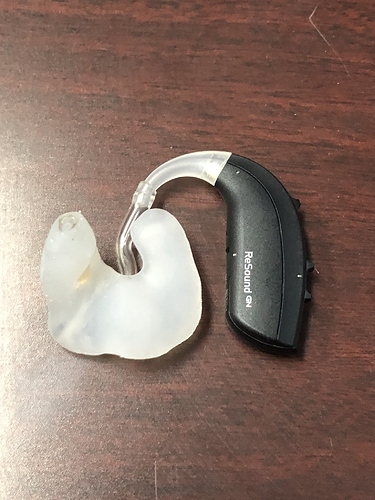 I apologize for my regular English (I’m from Guatemala) I’m user of ReSound Enzo 3D in my right ear, with soft silicone mold, (it was the recommendation of my audiologist) to adjust as tight as possible. Nevertheless I’ve needed to push it constantly inwards to maintain the internal vacuum and dont hear distortion and decrease in audio quality. The mold was made twice to verify the right size and it’s just my measure. I have seen that they publish photos of of the Enzo 3D with hard acrylic molds, my question is this, which are better to maintain the proper position of the mold inside the ear? Soft or hard earmold? I’ve tried the soft silicone molds, hated them as every time I moved my jaw I had to push the stupid things back in again. Hard molds are much better, they at least stay where you put them. Excuse for my English too (I’m from Russia). I use two Oticon Dynamo. I tried many many different variations of earmolds. Now I have a pair of 3D created (UV photoplast) earmolds with 0.8 mm vent. If your audiologist can make 3D earmolds, you can also try PowerVent (very long curved vent). Thanks to everyone for your replies! I have a question, what are the UV Earmolds? I find I was always adjusting hard ear moulds but soft ear moulds, I never have to adjust.